Line a large tray with a sheet of parchment paper and set aside. Tip the chocolate into a large bowl and melt in the microwave in 30 second blasts, stirring between each one. Alternatively, sit the bowl over a pan of simmering water and leave until fully melted. Dip the open end of a cone about 3 cm into the melted chocolate, swirling the bowl to pool the chocolate deep enough if necessary. 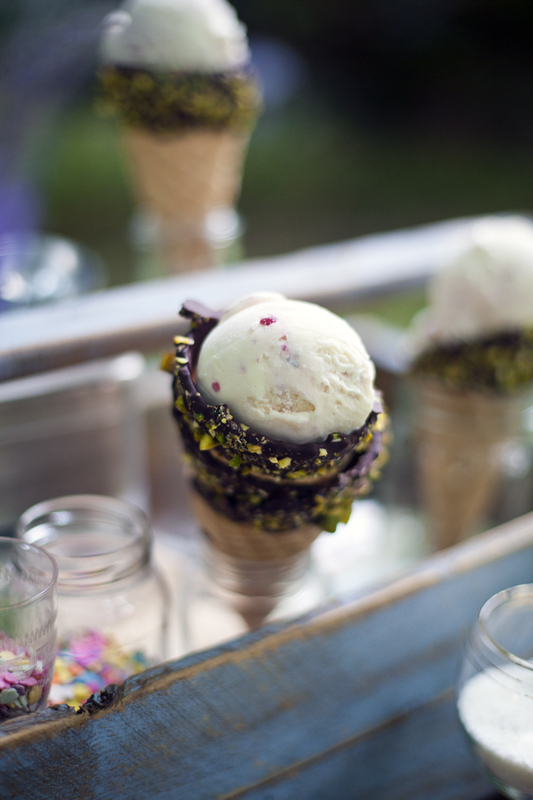 Quickly sprinkle the pistachios over the chocolate to stick and place the cone upside down on the tray. Repeat with the remaining cones and leave them to set. Choose two different sized bowls that leave a 3 cm gap between them when nestled one inside the other. Fill the larger bowl about a quarter full with cold water and press the smaller bowl down inside, until the top rims of both are aligned. The water should only come about half way up the gap at this stage. Stick the bowls in position together with sticky tape in a few places around their tops. Make sure the smaller bowl sits perfectlycentral so that the gap around the edge is even all the way around. 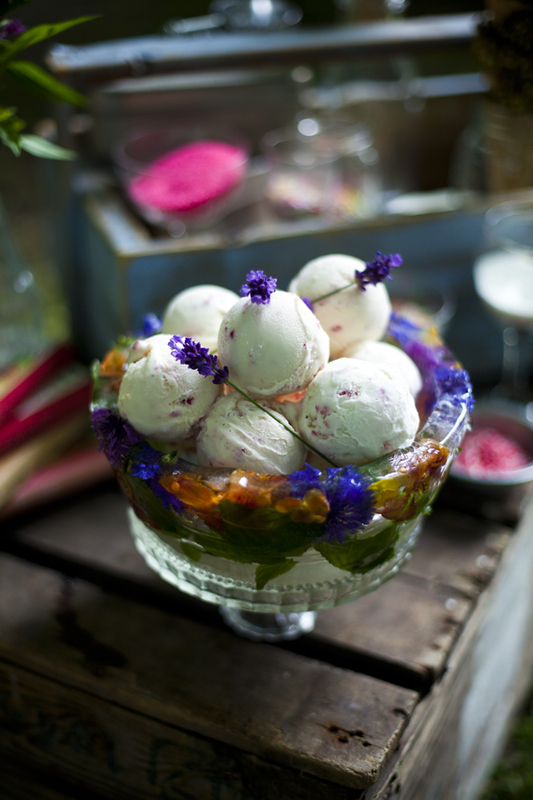 Push the flowers and the mint leaves alternatively into the water to fill the whole gap between the bowls. They should be quite tightly packed in to avoid floating to the surface. Transfer the bowl to the freezer and make sure it is on a completely even surface. Carefully pour water into the gap until full to the brim. Freeze for a minimum of 8 hours or overnight. Once frozen, remove from freezer and place in a large bowl of tepid water for a couple of minutes to loosen the bowls. Sit it on a plate or cake stand, with a rim. Fill with scoops of ice cream and serve at once. Blend the raspberries and icing sugar in a mini blender to a smooth puree. Pass through a fine sieve, discarding the seeds, this is ready to serve. 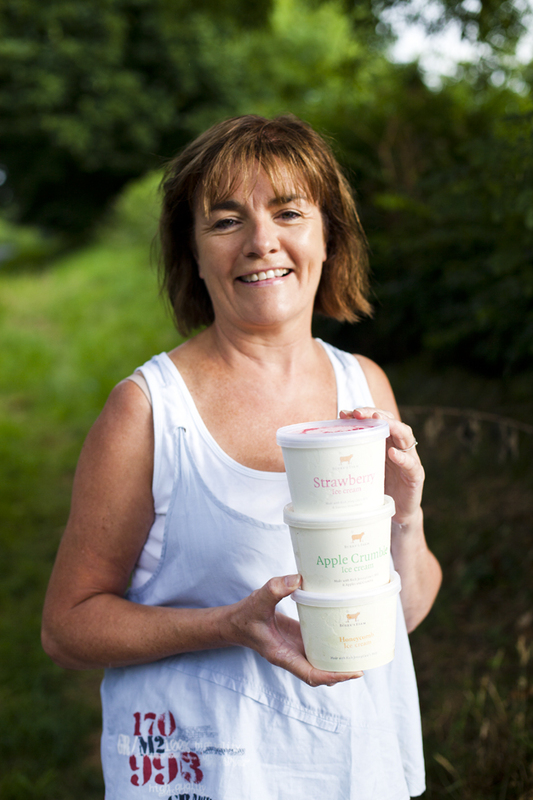 Bernie and John Burke have been producing ice cream since 2006 but they’ve been farming the land at Tara in County Meath for some twenty years. Making ice cream wasn’t something they decided to take on lightly. 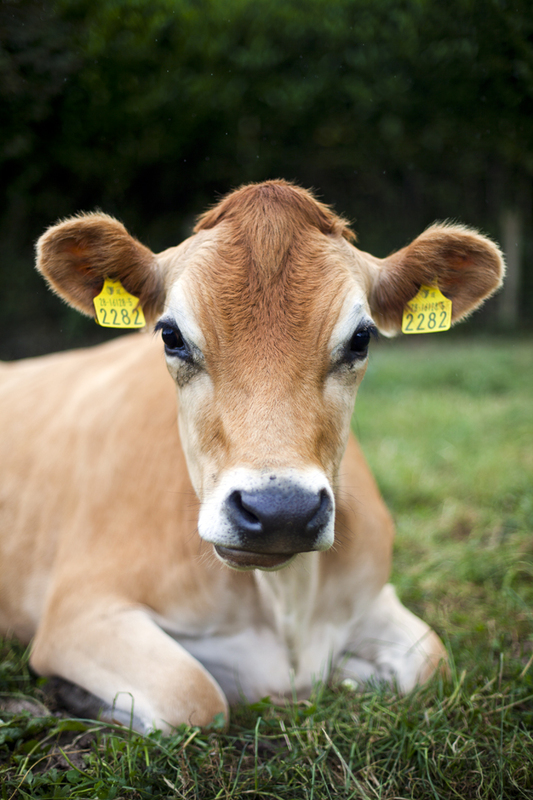 They did extensive research of ice cream farmers in England before deciding that the higher fat content of the Jersey cow gave the very best milk for their forty odd flavours. 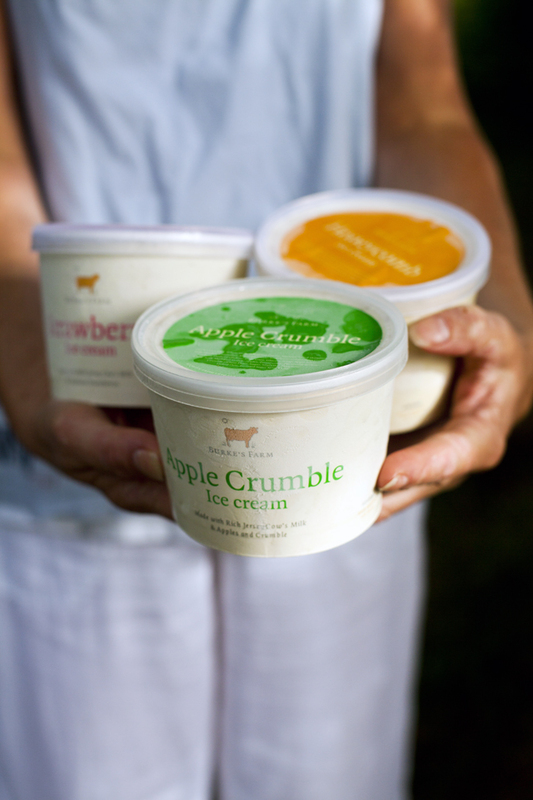 They also sought out the expertise of an Italian ice cream maker and their hard work has paid off with shelves groaning with awards including a Great Taste Award. 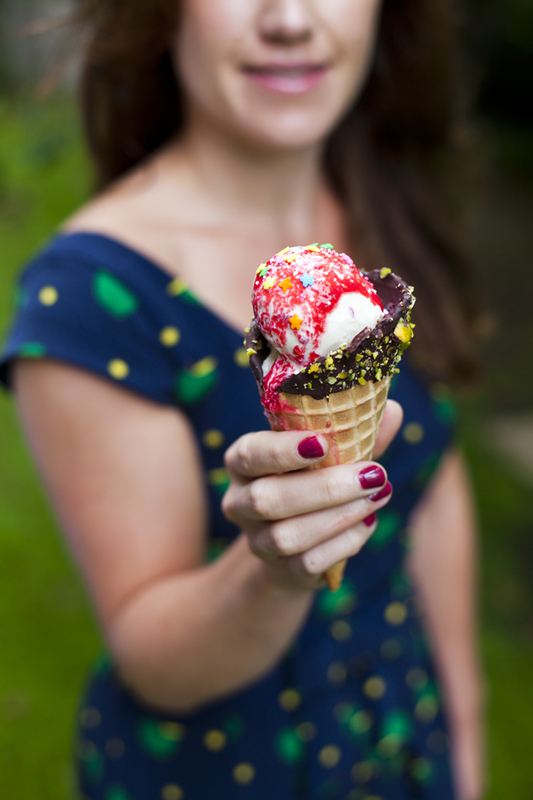 The variates of Burke’s ice cream and sorbet show a real flair for interesting combinations from Boyne Valley Blue Cheese and wild berries, to chocolate with hot chilli peppers, and even coconut sorbet. Classics are also popular like brown bread icecream as well as rum and raisin, but by far their most popular flavour is honeycomb and vanilla. Bernie says they can hardly keep it on the shelves, though her personal favourite, is her own creation, panna cotta and raspberry ice cream. 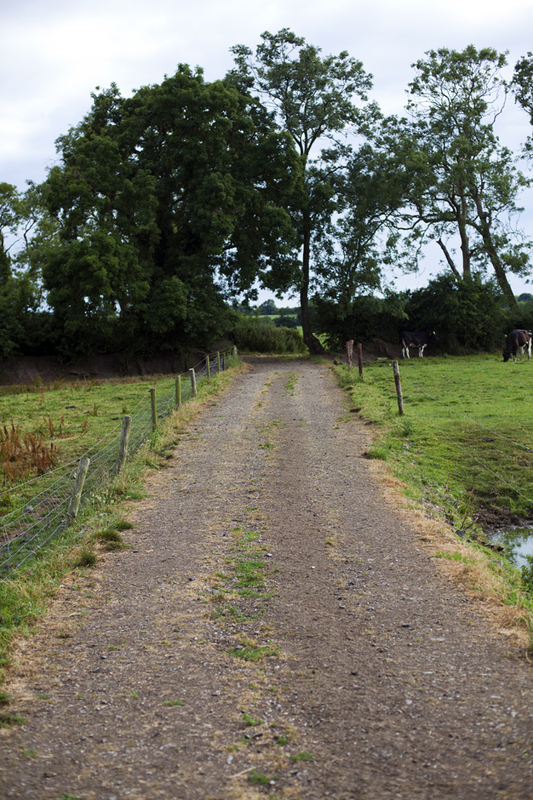 People are welcome to visit the farm and see the Burke family in action. It is a labour intensive enterprise as they hand fill the tubs but for those who prefer their icecream in larger portions you can order an ice cream cake too. Now that’s our idea of a feast. 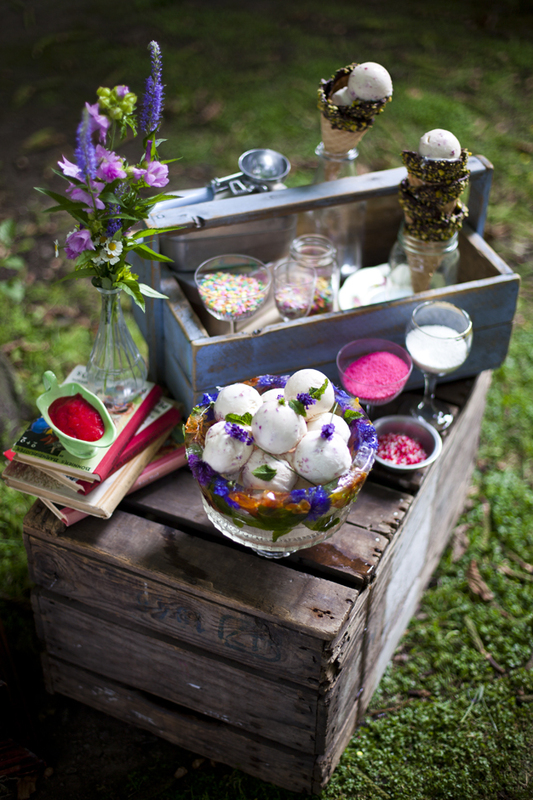 Check in next week as we will be sharing how we put this fabulous icecream to use at our FEAST. Heat the butter in a large saucepan, add the onion and cook for about 5 minutes until softened but not browned. Toss the sorrel through then shake the flour over the vegetables, mix well and let it cook for about 1 minute. Meanwhile, bring the stock to the boil, then add to the pan. Then add the breadcrumbs, season to taste and bring to the boil. Simmer for about 1 hour, covered. Then, liquidise until smooth. Beat the egg yolks with the cream and stir a little of the hot soup in. This ensures the eggs don’t scramble. Then gradually add the mixture into the hot soup pot, stirring well, over the heat but being careful not to let it boil. Sear the meat slices in a hot dry frying pan for 30 seconds on each side until crisp and golden. 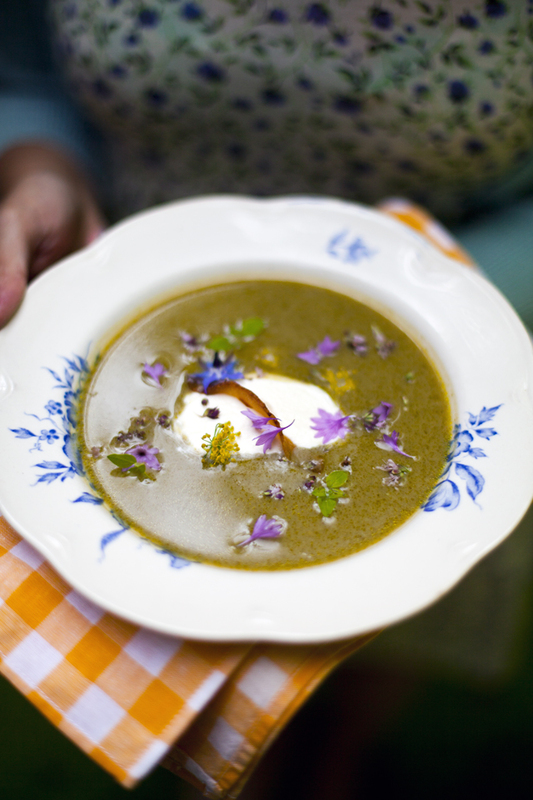 Ladle the soup into wide rimmed serving bowls. Spoon a little crème fraîche in the centre of each and stick a piece of crisp guanciale into each one. 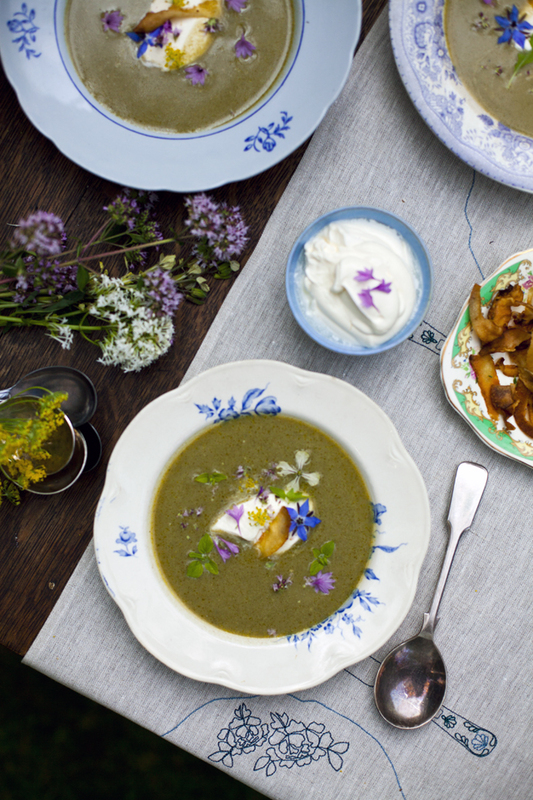 Scatter the micro herbs and edible flowers over and serve. 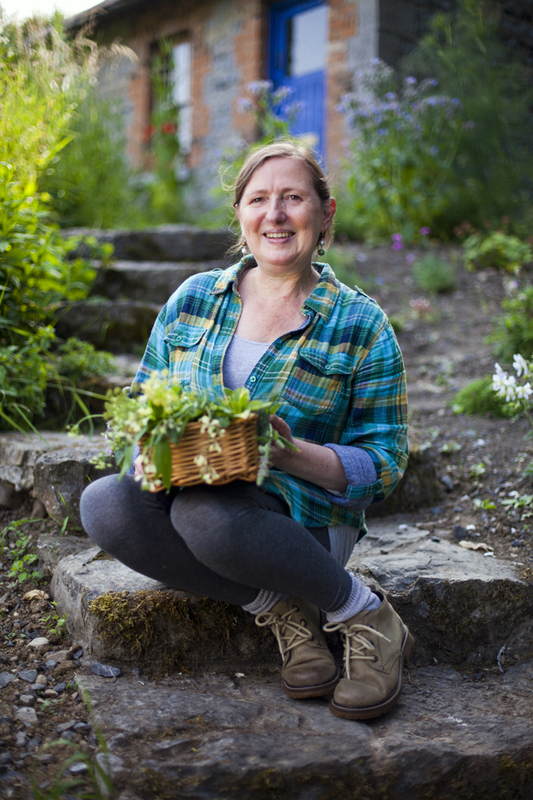 Denise Dunne grew up in suburban Dublin in Santry in the 1960s but unlike the urban gardens of other homes her parents filled their’s with every imaginable edible plant and some animals too, creating a home-grown paradise in a quiet cul-de-sac. Good food was important to her family and they were practically self- sufficient long before it was fashionable. 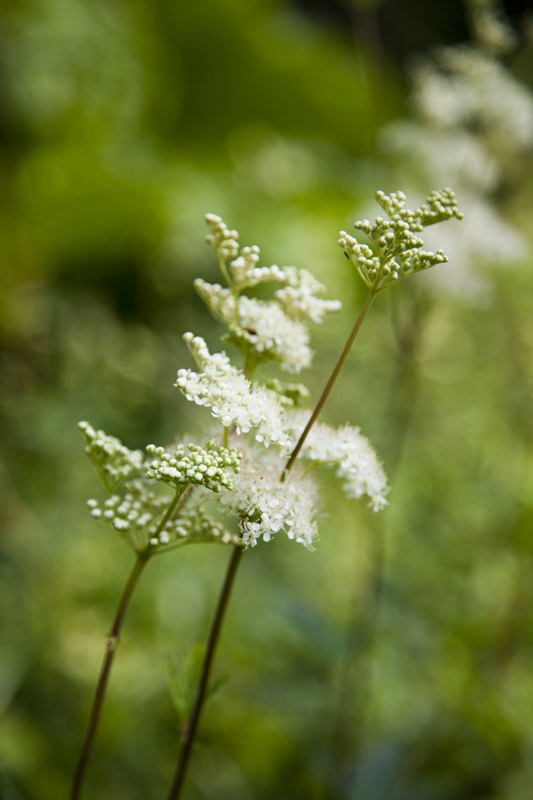 This meant Denise’s childhood was utterly immersed in the world of herbs and plants. 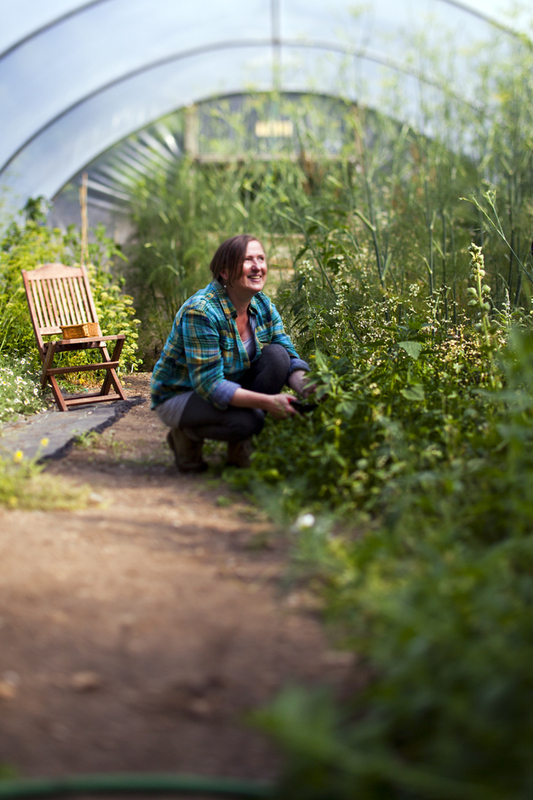 Today she runs The Herb Garden, a certified organic herb nursery, where you’ll also find organic salad leaves, flowers and native Irish wildflower seeds. Denise’s knowledge is encyclopedic and runs beyond the more obvious use of herbs in cooking to safe medicinal remedies as well as cosmetic uses and even general household work. 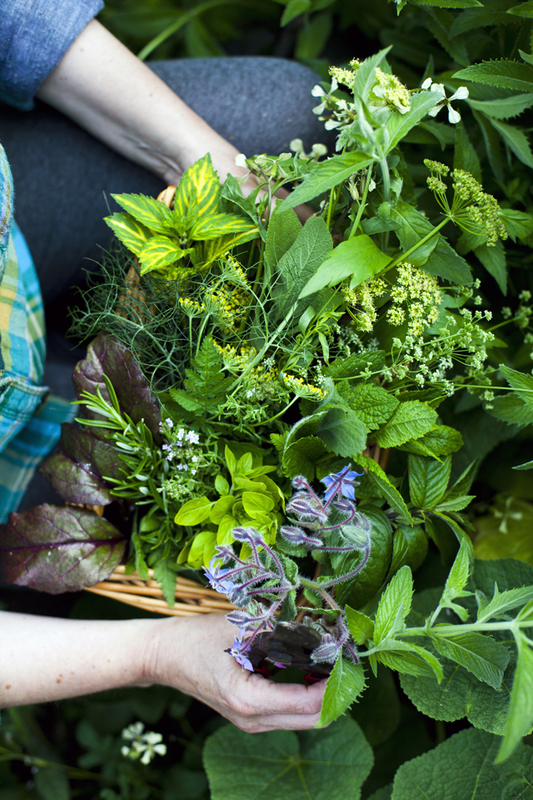 After a few minutes chatting to Denise we realised she’s the go-to person for all things herby – from recreating a medieval garden to a sensory space, you’ll hear the story of every herb as she chats and offers you a nibble of the leaves. An ideal person to supply us with sorrel for our soup recipe.